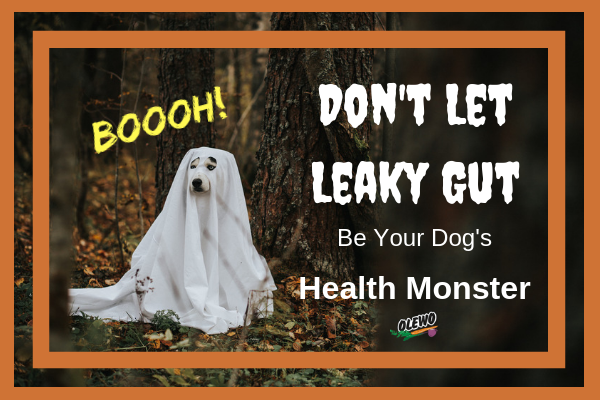 We posted this article last year for Halloween to help raise awareness of a growing health epidemic, leaky gut in dogs. I know we have many new visitors on our website this year. Some might be unaware of the leaky gut syndrome that is driving devastating chronic health conditions in pets as well as in people. Health conditions not only related to the digestive system, but also diseases of the skin (allergies), joints, thyroid, heart disease, brain, and even behavioral problems. Leaky Gut can cause autoimmune disease and even some forms of cancer if left untreated. Leaky Gut in Dogs. Is this Monster Still Chasing Your Dogs? I have a question for those of you who read this article last year. Have you done some more research, and are you doing everything you can to keep this Leaky Gut Monster away from your dogs? Or is this Monster still all over your dogs trying to ruin their health?? This is a very serious topic that you will read about in many of our other blog posts. Today we are depicting this all too real leaky gut health monster in a spooky and scary way – in honor of Halloween. Leaky gut in dogs can be a real monster. It allows TOXIC food particles, environmental CHEMICALS, and BACTERIAL WASTE to leak through HOLES in the digestive tract into your dog’s body. Instead of keeping the bad stuff out, the damaged lining of your pet’s intestine is letting all the bad stuff in. Once that bad stuff goes into your dog’s bloodstream, the MONSTER comes out and the NIGHTMARE begins. Unless you gear up and help fight this monster, your pet’s body will start breaking down from the inside out. Sounds scary, doesn’t it? And did you hear that I said…YOU need to gear up? And this is the scariest thing about it. Millions of pets and people everywhere are suffering from chronic illnesses associated with leaky gut right now. And modern medicine isn’t doing anything about it… You need to take charge of your pet’s health, and you can do it! Who am I to make this kind of statement? Well, this leaky gut monster tried to destroy my own health! You can read my story here and how it relates to our pets. I geared up by doing a ton of research and educating myself. I had heard of leaky gut before, but it really freaked me out the more I learned about it. Then I got out my weapon and killed that ugly monster. My weapon was the only weapon I could count on – MOTHER NATURE! That monster didn’t even stand a chance. The scariest part of my new found knowledge was when I realized that this monster has been sneaking up on me slowly and making me miserable for many years. It ruined some of the best years of my life. I guess I didn’t see the bloody writing on the walls! And all along my doctor was just treating my symptoms while keeping the monster inside me alive. Enough to make you mad? Did I Lose my Dog because of Leaky Gut? I freaked out even more, and that’s when I was really shedding tears, when I realized that when I lost my precious Dachshund Waldi 10 years ago, he probably died of leaky gut! And all his vet did was treat his re-occurring symptoms, while the monster inside of him kept destroying him. I remember the day it all went bad and he was crashing in my vet’s office. What was happening surprised my vet as much as it surprised me, because I thought it was just another episode of colitis. All my vet could say was that she had no idea what was going on. Back then I had no clue about leaky gut in dogs, and apparently neither did my vet, but it was definitely a wake-up call that something had gone terribly wrong. I knew I needed to gear up and do better for my other dogs. I am providing the very best in nutrition and care for my other dogs since that dark day when I lost Waldi so unexpectedly, and it paid off. I just recently lost my precious girl Wilma, a black lab mix, but she made it to 16+ years!! No Leaky Gut Monster will come near me or my pets ever again, I will make sure of that. Stop feeding processed food. 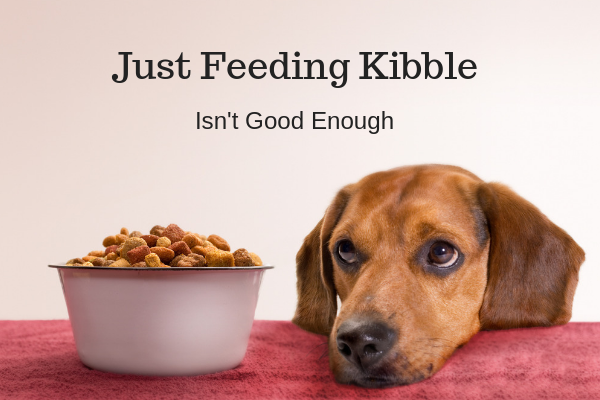 Kibble is the worst thing that was ever introduced and it is the least nutritious food you can feed your dog. Nutrition is the key to a healthy immune system and resistance to disease. You need to provide a variety of whole, nutrient dense foods for health and longevity. This is absolutely needed for your dog not just to survive, but to thrive. You might not think you have the time to prepare food for your dog, but it is not as hard to do as you might think. We need to put our own and our pet’s health before convenience. There is nothing more precious than our health. There are many good resources out there to help you prepare real food for your dogs, whether it is a raw diet or home-cooked meals. If you are not ready to prepare raw or home-cooked meals, there are commercial raw diets that offer frozen, freeze dried or dehydrated choices. Or consider wet food in a can, anything is better and more nutritious than kibble. If kibble is your only or primary option, it is important to educate yourself so you can select the best nutrition possible in this food category. And if you’re able to include just some home-cooked, raw, freeze-dried, dehydrated or canned food, that will make your dog’s meals more nutritious. Avoid drugs whenever possible. Antibiotics are a common cause for leaky gut in dogs because they kill both, the good bacteria and the bad bacteria. Other drugs have the same effect such as corticosteroids and NSAIDS (non-steroidal anti-inflammatory drugs). 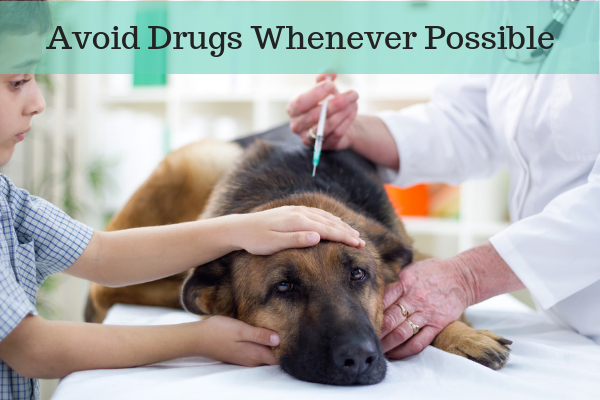 Deworming Drugs and flea and tick treatments also add toxins to the dog’s system. I would like to add that if your dog was eating a healthy and nutritious diet, more than likely these drugs wouldn’t be needed in the first place. Reduce the stress in your pet’s life. 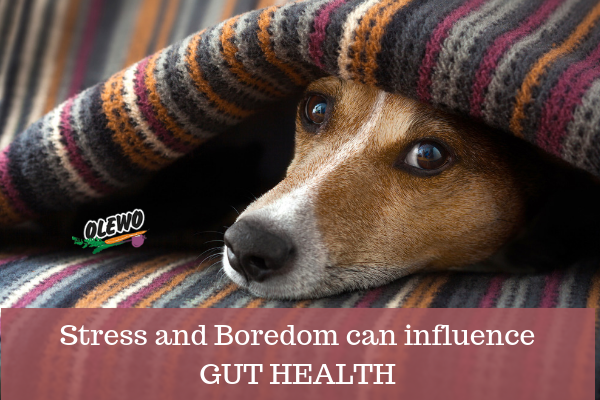 Chronic stress and boredom can also influence gut health. Your dog needs exercise and mental stimulation for well-being. Stress has a negative affect on the immune and digestive systems and can be a trigger for leaky gut in dogs. 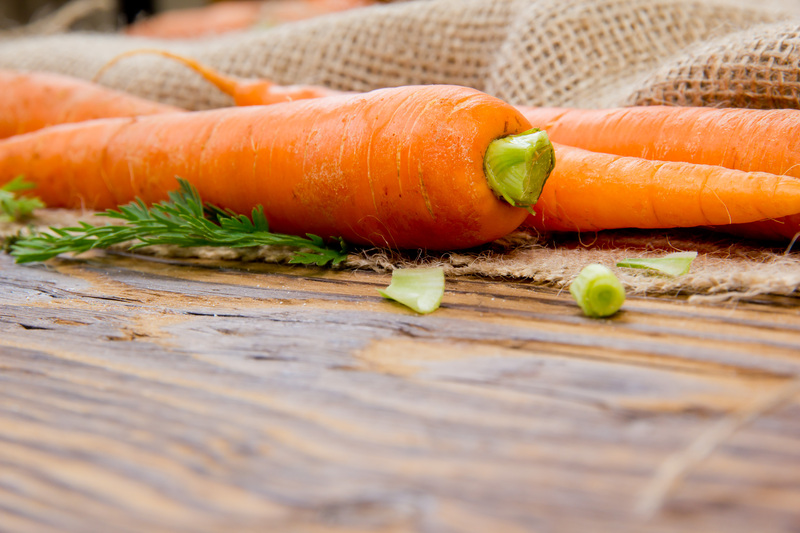 Add whole food nutrition to your dog’s meals like Daily Carrots for Dogs for gut health and Daily Red Beets for Dogs for detoxification and anti-inflammatory – all are key factors in preventing and healing leaky gut in dogs. Add probiotics and digestive enzymes. Add a quality fish oil for omega 3’s. I only use a Sardine & Anchovy Oil because these small fish don’t live long enough to collect dangerous levels of heavy metals in their bodies. 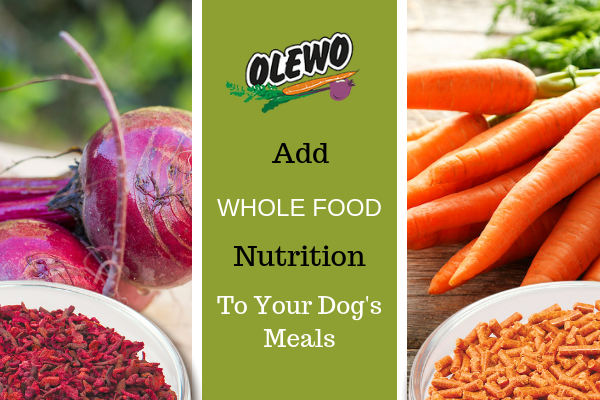 At Olewo we are all about natural solutions for your pets so they can be healthy and happy. We are all about utilizing the amazing power of nature. When you stay as close to nature as possible, you will experience amazing results in health, overall well-being, and longevity. Nature is good. Nature is good to you. Nature is good to your pets.